Make learning the 7 times table fun with our Football Multiplication Math worksheet. 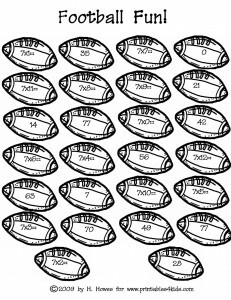 Use the football printable for a memory game or flashcards. Here’s a game idea for 2 or more players. Cut out the football shapes and stack the “problems” on one side of the field and the “answers” on the other. The first player draws a problem football and then has to find the answer football in a certain time or less (10 seconds, 30 seconds, etc depending on level of child). Every match is a “Touchdown!” and player gets 7 points. Highest score wins! Invent your own variations and have fun. Perfect for the classroom!